This Mother’s Day, give your favorite lady the gift of great design. Our collection includes elegant gifts that every mom will love, from classic cookware to iconic glassware. Explore ten of our favorite designs here, and be sure to view the full collection at the Dwell Store. Originally inspired by components of Bower NYC’s furniture line, the Forma Sculptural Candle Set began as a small sculpture. After deciding that the piece needed another element to bring it to life, the designers added a candle—fire—to create a more complete accent. 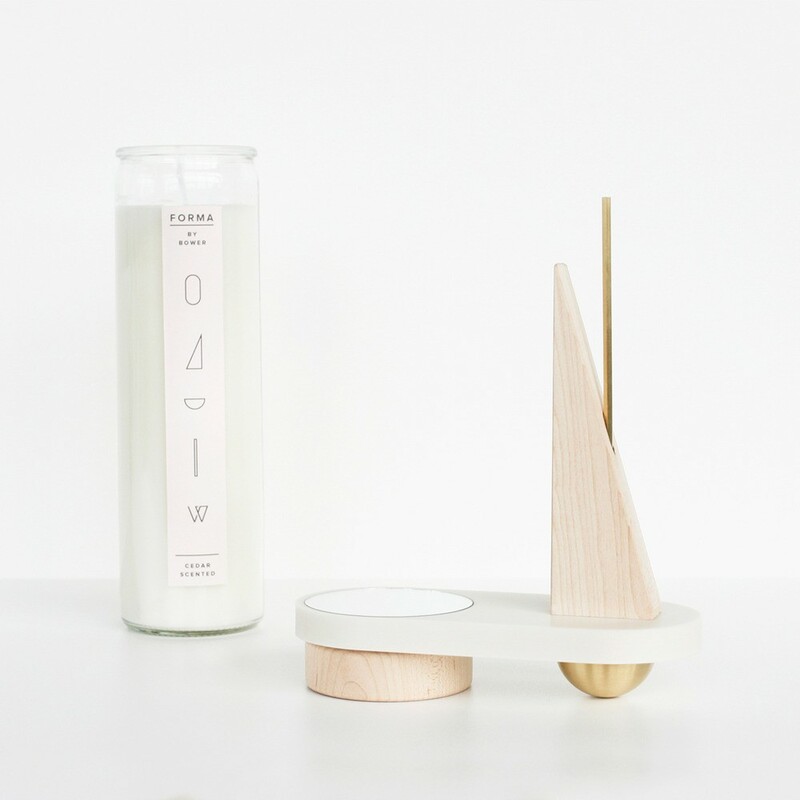 The set is comprised of a soy wax candle with a cedar scent that is housed in a simple glass vessel, a brass tube that can be used as a match extender, a corian surface, glass mirror, maple wood, and brass shapes. All of the elements combine to create a candle holder that is a truly functional work of art. Falcon’s iconic enamelware has been a staple brand for British home items since its opening nearly one hundred years ago. Enamelware is porcelain fused onto heavy-gauge steel, which makes it durable, smooth, and resistant to the effects of chemicals. This Prep Set from Falcon is a baker’s dream. The six-piece set includes a colander and five mixing bowls, perfect for separating flour, sugar, and other ingredients. The durable bowls are also an attractive option for popcorn and chips. When not in use, the bowls stack together for easy storage. The Craig Carrying Case from Delfonics is a roomy pouch that can be used to hold a tablet, pens and pencils, notecards, and other work essentials. Petite enough to fit into a messenger bag or large purse, the Craig Carrying Case features a gold-toned zipper closure. The case can also be used as a clutch that will easily hold a phone, wallet, and keys. In addition to the zippered compartment, the case includes a front pouch that is secured by two gold-toned snaps when the case is folded over. The smartly designed case also delivers a secret message within the front compartment: “It all depends on how you see and interpret things.” Available in medium and large sizes. The Nest Caddy is a versatile storage solution that can be used in several ways. The wood caddy can be used to store pens, pencils, jewelry, or even makeup. The caddy’s lid can be used to conceal contents, or can be flipped over to hold additional items, or can be used as a tray. The metal holder can be used as its primary function—to transport the caddy—and can also be used to hold a tablet or display an art print. The versatile Nest can be used in a home office, as storage on a bedroom dresser, or even in a kitchen. Designed by Swedish designer Monica Förster, the Brushed Brass Flower Pots celebrate the shape of traditional terracotta pots and elevates the look with a luxurious material selection. Maintaining the historical production methods of the Skultuna factory, these flower pots are made through the traditional practice of metal spinning. Through this process, Skultuna is able to make a round three-dimensional object out of sheet metal. The brushed nature of the flower pot gives it a distinctive look that is at once elegant and edgy. The pot can be used for a variety of plant types, and makes a striking storage vessel when not in use as a planter. Donna Wilson’s Field Day collection is a celebration of traditional Welsh weaving. Made from a strong single-ply wool that softens over time, the Field Day Throw features a plaid-inspired pattern with a modern slant—unexpected colors and details complete the textile. The wool is spun and dyed in England and is then woven in Wales using the traditional double-cloth weaving technique. The result is a throw blanket that has an undeniable heirloom-quality that will complement a modern living room or bedroom. The Stamen Glass Vase was originally imagined from Niche Modern’s Stamen Pendant light, a spherical ceiling light. Recast as a dramatic tabletop vessel, the Stamen is inspired by the natural forms of the flower and can house a variety of delicate blossoms. Its globular silhouette makes the Stamen vase a decorative accent that is striking, even when not full of flowers. The vase can be used on a dining room table, mantel, or on a side or bedside table. Designed by Norm Architects for Menu, the Steel Table Clock is a celebration of materiality, color, and simplicity. Paring down the clock to its most necessary elements, the designers took the expected silhouette of a wall clock and folded it to create a clock that can rest on a flat surface. The clock is available in four colors, all of which were chosen for their connection to the Scandinavian climate. Powder-coated for a smooth finish, the clock is unobtrusive, and was designed to be an enduring, timeless addition to a home. Also available in a wall clock. Created by Quebeçois designer Zoë Mowat, the Arbor Jewelry Stand takes its inspiration from bowerbirds, a type of bird that displays an array of brightly colored objects in and around their nests. Similarly, the Arbor provides a colorful refuge for valued treasures like earrings, necklaces, and rings. The sculptural perch incorporates an integrated and removable mirror, brushed brass details, and colored platforms that display items while keeping them safe. A detachable solid wood dowel acts as the main support for hanging necklaces and bracelets. This colorway is exclusive to the Dwell Store. A new 2015 addition to Yield Design Co.’s fleet of products, the Field Bag is a versatile tote that can be used for a variety of occasions. It can be used for taking lunch to work, packing a picnic, shopping, or even as a shopping tote. The Field Bag includes two side pockets that are roomy enough to fit a wine bottle in each pocket. The bag is comprised of water-resistant duck canvas, and includes copper rivets and vegetable-tanned leather handles. Each element in the Field Bag is made of materials made in the United States, and is assembled in Yield Design Co.’s St. Augustine, Florida studio.